CALIFORNIA 42 • SHOPPING CENTER BUSINESS • September 2018 B y all accounts, California is known for being big. It is the most populous state in the nation, with $2.7 trillion in GDP, according to recently published fed- eral data. This makes California the world's fifth largest economy — ahead of the United Kingdom. As expected, the retail market has followed suit. "California offers world-class shop- ping, entertainment and tourist desti- nations, which translates to having the highest number of retail stores with more than 420,000 establishments, nearly 30 percent more than the next highest state, Texas," says Jeff Lefko, vice president of Hanley Investment Group in Corona del Mar, Califor- nia. 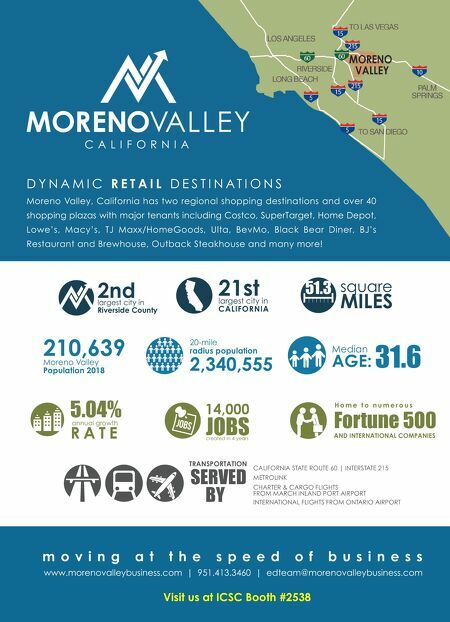 "More than 4.7 million people are employed in retail-related jobs across the state, which accounts for almost one-fifth of California's total employment." It may seem that the Golden State is living large, but savvy investors are preparing for change. While we may not be in a retail apocalypse, surviv- al is on the minds of many in this industry. 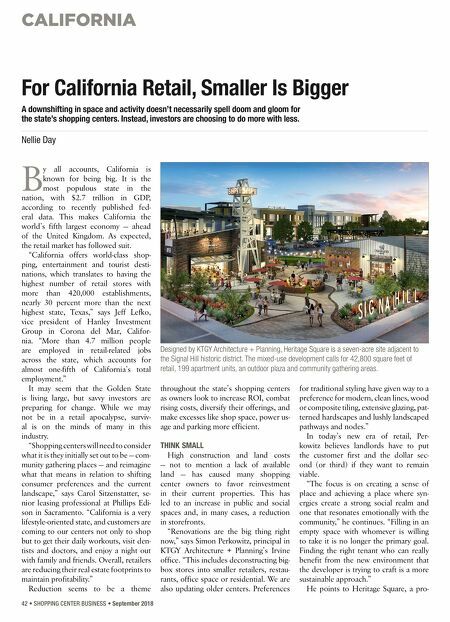 "Shopping centers will need to consider what it is they initially set out to be — com- munity gathering places — and reimagine what that means in relation to shifting consumer preferences and the current landscape," says Carol Sitzenstatter, se- nior leasing professional at Phillips Edi- son in Sacramento. "California is a very lifestyle-oriented state, and customers are coming to our centers not only to shop but to get their daily workouts, visit den- tists and doctors, and enjoy a night out with family and friends. Overall, retailers are reducing their real estate footprints to maintain profitability." Reduction seems to be a theme throughout the state's shopping centers as owners look to increase ROI, combat rising costs, diversify their offerings, and make excesses like shop space, power us- age and parking more efficient. THINK SMALL High construction and land costs — not to mention a lack of available land — has caused many shopping center owners to favor reinvestment in their current properties. This has led to an increase in public and social spaces and, in many cases, a reduction in storefronts. "Renovations are the big thing right now," says Simon Perkowitz, principal in KTGY Architecture + Planning's Irvine office. "This includes deconstructing big- box stores into smaller retailers, restau- rants, office space or residential. We are also updating older centers. Preferences for traditional styling have given way to a preference for modern, clean lines, wood or composite tiling, extensive glazing, pat- terned hardscapes and lushly landscaped pathways and nodes." In today's new era of retail, Per- kowitz believes landlords have to put the customer first and the dollar sec- ond (or third) if they want to remain viable. "The focus is on creating a sense of place and achieving a place where syn- ergies create a strong social realm and one that resonates emotionally with the community," he continues. "Filling in an empty space with whomever is willing to take it is no longer the primary goal. Finding the right tenant who can really benefit from the new environment that the developer is trying to craft is a more sustainable approach." He points to Heritage Square, a pro- For California Retail, Smaller Is Bigger A downshifting in space and activity doesn't necessarily spell doom and gloom for the state's shopping centers. Instead, investors are choosing to do more with less. Nellie Day Designed by KTGY Architecture + Planning, Heritage Square is a seven-acre site adjacent to the Signal Hill historic district. The mixed-use development calls for 42,800 square feet of retail, 199 apartment units, an outdoor plaza and community gathering areas.